Let us turn your ideas into reality. It’s just as important to build the right thing as it is to build the thing right. We’ll work with you to gather your functional and non-functional requirements to make sure we understand your needs and how best we can help, then document it formally so you know exactly what you’re getting from your investment. From conceptual designs through to formal technical drawings produced in CAD, our industrial design and drafting team collaborates to make sure your custom kiosk strikes the right balance between form & function, without breaking the bank. The sooner design improvements can be identified the earlier (and cheaper) they can be implemented. We can produce part and whole-kiosk prototypes at different levels of detail, from 3D printing to foamcore or craftwood models all the way up to short-run manufactured parts. Have a specific hardware component you’re looking to integrate neatly? We’ve got experience with almost any kind of part you can imagine. Let us help build in your necessary parts securely and attractively. There are enough awkward, hard-to-use systems in the world, don’t let your kiosk be one of them. By testing design decisions and alternatives early and often and incorporating the insights gathered you can ensure your kiosk is a joy to use. 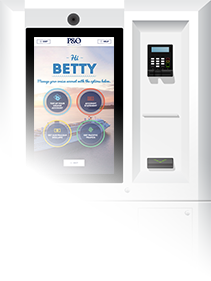 Between our own engineering workshop and our many local partners, we’re able to produce almost any kind of kiosk enclosure you can imagine, from short-run jobs to 50 units or more. When you’re building a one-of-a-kind product, it’s essential that you know you’ll be supported for the foreseeable future. Our network of national technicians can provide on-site servicing & maintenance to limit your downtime, and we’re equipped to make future retrofit enhancements as needed so you can extend the value of your investment as your needs change.